The contents shown here is the one as of the date of announcement. Please be noted that It may be changed without notice. We assent “Ecocap Movement” activity. 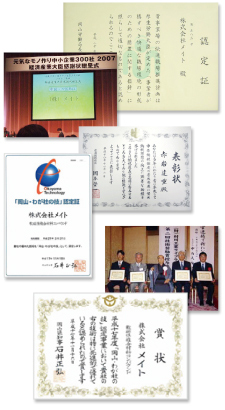 It was decided that 2009 Chugoku Region Quality Award – Challenge Category Challenge Award would be given to Mate Co., Ltd. Awarded "Excellent Supplier Prize" by Motor Company, Panasonic Corp. Awarded "41st Okayama Prefecture Miki Memorial Grant"
Established “Shanghai Mate Trading” in Shanghai China.